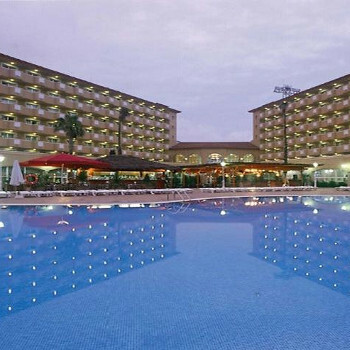 iloved this hotel, we went with my mums friends and there chrildren, it was the best holiday ever i went to a theme park which it near its called portaventura i think, i had a great time so did my family and there friends i would love to go again! This is a lovely looking hotel and rooms are very nice and very clean, pool area is good and there is always something going on round the pool. Please watch out if you are going to this hotel though, on the first morning round the pool my purse was stolen out of my bag, also my room key and safe key, they went in our room and took cash, credit cards, travellers cheques, jewelery, dvd player. Somebody had definatly been watching me as they knew exactly where in my bag which was on a buggy that I had put my purse. Hotel didn't really seem that bothered about it, as we had nothing I asked for alll inclusive just till we could get some money sorted out, was told no, the manager wouldn't even come out from his office to talk to me. Just keep an eye on where you are leaving you things round the pool and someone may be watching. Really great hotel! Ok the location was not perfect and the food in the hotel got a little bit boring after a week, but overall we would highly recommend this hotel. Hotel is at the edge of the resort. The front of hotel overlooking an industrial area and oil refinery. Hotel looks impressive but more like a Holiday inn Express. Walls are paper thin, we could hear the people snoring in the next room, the air conditioning was excellent though. Dining room like a motorway service station, poor service, not much variety, cheap cuts of meat and lukewarm food. We stayed October half-term and everything in the surrounding area was shut apart from two local bars. We had to get the bus to Salou every night as the hotel entertainment was rubbish and drinks were expensive. There is a nice prom but full of grotty hotels, British bars and souvenier shops. Good points- The bus service is excellent and cheap and runs till late at night, taxis expensive though, cost 35 euros from airport which is only 10km. Theme park ok for a day out but don't get a week pass not worth it. You can get round it in two days max. Take a tour bus to Barcelona you don't need to book just get on at a bus stop. Just arrived home from Gran Hacienda Hotel, had a brill time. This is probably one of the cleanest hotels I have stayed in, maids coming in every day to tidy rooms,hotel and pool area spotless. The food was good for the first few days but then did get a bit repetitive and also found that it was never very hot but always plenty of choice, fish,meat salad etc. Loved the location.It's the first hotel as you come into Pineda so you're not in the heart of everything but it was a nice 20-25 walk into Pineda for shops bars restaurants. Staff were ok but the entertainment was rubbish for English people,they did cater a lot for the Spanish that were there. They have waterpolo,volleyball and footbal during the day but evening was rubbish. We would definitely go back because we love the resort and the hotel was good nice for a relaxing break. We stayed all inclusive which was really good, drinks all day and food from the pool bar if you wanted it. We stayed in the La Gran Hotel Hacienda on a half board basis for 2 weeks which looks lovely from the outside. Rooms are ok but not huge for a 4 * hotel. There were 2 double beds side by side & not much room left, TV with 2 English-speaking channels, CNN news & German MTV that had lots of American programmes. Great to keep the kids amused when in the room. There was very little wardrobe space or drawers, certainly not enough for 4 adults which these rooms can accommodate. Air con was brilliant, in fact this was the best thing about this hotel. First of all, I don't think this hotel is a 4 star hotel. Thats not to say the hotel isn't nice, its just lacking that something extra. The pool area was very clean and quite quiet when we were there, and all the bar staff were very friendly, even taking the time to correct my awful attempts at spannish! The food was a bit hit and miss, breakfast not all that good, although the evening meals were very nice. As previously mentioned no baby chairs which was a bit frustrating. Unless you are AI, drinking in the hotel is a bit of an expensive business and not recommended. Internet still not working in June, again as previously mentioned, reception staff don't want to know. Reception staff were a let down, it seemed like you were an inconvience to them, not a very friendly welcome. The rooms however were spotlessly clean, and much larger than I would have thought, containing to double beds. We had the view looking towards Port Aventura, just don't look the other way towards the BASF chemical factory, bit of an eyesore. Again all the maids very friendly in the morning. They do seem to be trying in some areas, just lacking in others, if this was a 3 star hotel it would get 5's across the board. Nice fresh hotel, excellent pool. Food repetative, but OK, excellent presentation taste not quite as good. Dishes and plates sometimes a little dirty, especially cups and glasses. No high chairs for babies in restaurant - very poor indeed for that. Room good, clean, nice balcony. reception staff not interested, verging on the rude. Restaurant staff very nice, especially to kids. hotel is a little out of resort centre (bearable 10 mins walk), but one of the nicest hotels I have found in Spain. Internet never worked when I was there - reception staff said nothing to do with them - but nothing was to do with them !!! A great hotel spoiled by the usual not my problem attitude of reception staff. Stayed at the La Hacienda the last 2 weeks of August and loved every moment of our stay. On arrival we were told that are room wasn't available until midday which was ok as it had to be cleaned. The rooms are truly spacious with 2 double beds and not at all cramped. The air conditioning was great as the weather was very hot. I would advise you pack lots of hangers as there were only 6 in our wardrobe. Fridge and safe can be hired but I am not sure how much this costs. The pool are is lovely and we never had a problem getting a sunbed but alot of people do reserve them. Food was delicious and varied. There was always a good selction to chose from and the desserts were heavenly. Bar prices were a little bit on the dear side eg 4.5 euros for Tia Maria, 2 euros for a small bottle of coke but then again you usually pay dearer in a hotel. English, Spanish, Russian, Greek all stayed in the hotel so there was always lots of different languages spoken around the pool. The hotel run mini club was excellent for our 8 and 4 year olds. The hotel deseves its 4 star status and it was a delight to stay here. Highly recommend and would certainly stay here again.